What is Bhumisparsa Mudra? This mudra is commonly associated with the blue Buddha known as Akshobya. Bhumisparsa Mudra is translated as Touching the Earth, or Calling the Earth To Witness the Truth mudra. It represents unshaken strength and the truth of his commitment to liberation, which helped overcome the darkness. The Bhumisparsa Mudra can be expressed that the left hand lies palm facing up on the seated Buddha’s lap, the right hand lies curved over the Buddha’s crossed knee, fingers just touching the ground. It is one of the most common iconic images of Buddhism. Bhumisparsha Mudra is found frequent expression in Thai Buddhist shrines. There’s a story behind it: when Shakyamuni (Gautama Buddha) was deep in meditation, he was tormented by the demon Mara who would try and distract him with storms or tempt the Buddha with his three daughters. The hand pointing downwards was Buddha’s call to Sthavara, the Goddess Earth. Rising from within the ground, she wrung her hair dry of water – an action that caused floods and washed away Mara and his demon army. 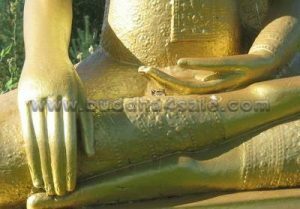 So where is the best FengShui placement for a Bhumisparsa Mudra Buddha? It is highly recommended to consecrate a Bhumisparsa Mudra Buddha at the main entrance of your home, the center of your home or altar, etc. Just by looking at this Buddha hand gesture one can connect to the energy of deep peace and serenity. It is a powerful FengShui decor adapt to any places!